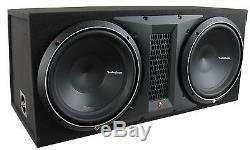 New Rockford Fosgate P2-2X12 12 1600 Watt Dual Loaded Subwoofer Sub Enclosure. 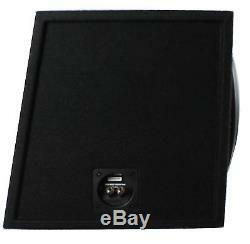 New Rockford Fosgate P2 2X12 12 1600 Watt Dual Loaded Subwoofer Sub Enclosure. Impedance: 1 ohm (Internally wired to create a 1 Ohm amplifier load). We are an authorized Rockford Fosgate dealer. 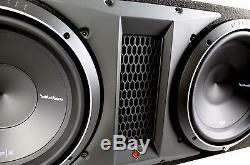 The Rockford Fosgate P2 2X12 is a dual P2 12â? The enclosure is constructed with 5/8â? MDF, covered in high density carpet, and features quick release compression terminals, high modulus Kevlar reinforced paper cone, dual tear and fatigue resistant poly cotton spiders and tall profile Santoprene surround. The dimensions are 15 3/4"D x 33 7/8"W x 15 1/8H. Proprietary high flow, low noise port Constructed with 5/8 MDF High current binding posts. High modulus Kevlar reinforced paper cone. Dual tear and fatigue resistant poly cotton spiders. High temp voice coil with spun laced Nomex insulating reinforcement collar. Optimized motor magnetics with extended pole and bumped backplate. Fatigue resistant and reduced strain "stitched on" flexible lead wire design. Multi point high temp/high strength neck joint bonding technique. Sturdy 16 gauge compound bend frame geometry. Semi fexible PVC removable protective motor cover. Custom insulated/isolated compression input terminal assembly. Decorative die cast aluminum trim ring. Custom 10 AWG nickel plated push terminals. Double stacked ferrite magnet structure. 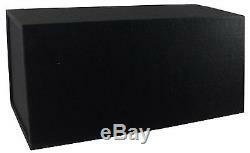 Enclosure Material: 5/8 MDF (Medium Density Fiberboard). Dimensions: 15.125" x 33.875" x 15.75. Item Weight: 76.25 lbs. Rockford Fosgate is terrifying to those that donâ?? Why would a person want thousands of watts of Rockford FosgateÂ® power in an amplifier that is bigger than most cars are wide? Because sometimes - too much is perfect! Rockford FosgateÂ® is ready for the future. We incorporate some of the most state-of-the-art facilities in the audio business. Best of all, our Amplifiers, Signal Processors and Woofers are designed and engineered in Tempe, AZ, USA! The consistent theme here is not just music or technology but the brilliant use of technology and circuit design to enjoy impactful and passionate music. A real passion for the experience of music. Obviously, Jim Fosgate is still pursuing his dream. He was awarded an EmmyÂ® Award for his work in developing surround sound technology for television. Yeah, this guy has defined himself with music and technology. Cancelling Your Order: Your order is important to us and will be processed immediately. Select the reason for the return. This listing is currently undergoing maintenance, we apologise for any inconvenience caused. 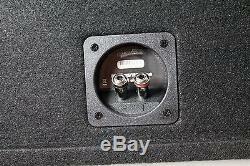 The item "New Rockford Fosgate P2-2X12 12 1600 Watt Dual Loaded Subwoofer Sub Enclosure" is in sale since Friday, July 11, 2014.